Made with finer yarns producing a lighter weight fabric - superior extra high drape factor. 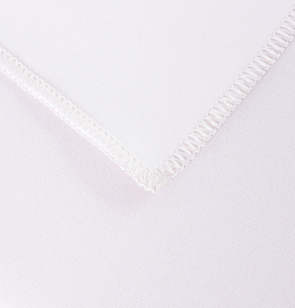 100% staple blended polyester - superior high drape woven fabric. High performance, long lasting material & low shrinkage. Formulated with STAINMAX® for INSTANT water absorption & stain resistance. We have also added a Quick iron-press finish for easy laundering. Requires only a 40c low energy wash saving time and money. The end result - beautiful crease free tablecloths. Suitable for Diners, Bistro's, Restaurants, Hotels & the Home. Woven fabric: quality specification - weight 190 GSM. All the napkins and tablecloths have a colour co-ordinated overlock stitched hem. The picture above shows the colour co-ordinated overlock stitched hem. All items are made to order and manufactured in Lancashire,UK. Need any help on what is the correct size you require call 0800 612 1379.